When it comes to bail bonds, one thing is for sure — people have a lot of questions. This makes sense, of course, because it’s a complicated subject and there are plenty of subtle changes that need to be made for each person. In other words, because every situation is different, the details will probably be a little different too. Add in the fact that bail bonds aren’t something that most people have to purchase on a regular basis and it can get downright confusing. Have you ever tried to do a search for an answer to your questions about bonds and found that you’re left with more questions than answers? That’s incredibly common! At Wanna Get Out Bail Bonds on Oahu, we want to do things differently. We strive to make our website a resource for people who are looking for information. Although we do our best to be thorough, we can’t answer every question out there. Here’s the good news though — you can always contact us because we proudly offer free bond advice and we’d be happy to answer any questions you may have about your specific situation. When it comes right down to it, our goal is to be the dependable and affordable bond agency that you can count on on the island of Oahu. We don’t believe that a person should have to spend any more time behind bars than is absolutely necessary, and when you contact us to help you get your loved one released, we’ll start working immediately to make it happen. No matter the situation that you’re in, no matter what time of day or night it is, you can count on our team of experts to lend a helping hand. We’re located in Honolulu, but we serve the entire island of Oahu by offering a process that’s speedy and reliable. As we mentioned above, we want to provide you with the answers you’re looking for. Our blog archive is a great place to find information, but we thought it might also be helpful to provide all of the information you need in one place. We’re covering a number of topics, so if you landed on this page, chances are that the answer you’re searching for is below. Need some clarification? Have a different question? Contact us any time to get the answers you need because we look forward to hearing from you! There’s no feeling quite as dreadful as the one you get when you receive a call from your loved one — “I’ve been arrested.” It’s quite a shock, and there’s no doubt that countless questions start popping into your mind. From there, we’ll get started on taking care of business. Figuring out how to bail someone out of jail can be a challenge, but when you turn to us, we’ll walk you through the entire process. We tailor our approach to suit your needs, so no matter what you’re up against, you can expect that we’ll have answers that you can count on. Learn more about how to get a friend out of jail here. Have you ever wondered if a person can pay their own bail? Although movies and television shows make it seem like someone has to dramatically show up to the jail and bail you out, the truth is that a person can facilitate his or her own release. All that’s needed to bail yourself out of jail is either the full amount the jail is requiring to be released, or the help of a bond agency (like us). Learn more about how to bail yourself out of jail here. Do bail bonds expire? That’s a great question. After all, you don’t want to purchase a bail bond only to find out that it’s expired and you have a warrant out for your arrest. Here’s what you need to know — there is no time limit on a person’s release. The only thing necessary is for the person who was bailed out to show up to his or her court date. There is more nuance to it than that, of course, but that’s the gist. You can click the link below to learn about more specific situations that you might come across, although the truth is that those situations are pretty rare. Learn more about how long bail bonds last here. Chances are that you Googled something like “bail bonds Oahu” or “Honolulu bail bond agent” to find us. But why should you choose us over the others? When it comes down to it, the truth is that our team will treat you like family. We know that you’re going through a particularly stressful and difficult situation, and we react accordingly, seeking to bring you peace of mind during a tough time. We’re also affordable, offering free bond advice, flexible payment plans, and more. We bring experience to the table as well, having been in our line of work for quite some time now. At the end of the day, you have plenty of options, but you can rest assured that if you choose us, we won’t let you down. Learn more about how to choose a bondsman here. So is Wanna Get Out Bail Bonds local? Absolutely we are! We’re Honolulu through and through, and living here on the island of Oahu is one of our greatest joys in life. Although there are several bond agencies on the island that are owned by larger entities, WGOBB is locally owned and operated. We know this place like the back of our hand, and that means that we’ll always have you covered. No matter the time of day or night, no matter the jail, you can count on us. Learn more about the importance of working with a locally owned bail bond agency here. Ever wondered what happens if you pay the money to bail someone out of jail and they suddenly just disappear? It’s also known as skipping bail, and it’s never a good idea. Generally speaking, the thing you should know is that you should never hide the person who skipped bail or else you will face legal consequences. It’s a tough situation to find yourself in because it can be incredibly difficult to know what the right thing to do is. Not to worry, because if it happens to you, call us and we’ll give you the advice you need. Learn more about what happens if you bail someone out of jail and they run here. How Do You Find a Bail Bondsman Online? The internet is an incredible resource that you can use to quickly and easily find what you’re looking for. Case in point? If you Googled something like “bail bonds Hawaii” or “Oahu bail bonds” and landed here, you’re starting off in the right direction! Once you’ve found a couple of options, it’s important to dig deeper. Our advice is to read reviews and see what kind of reputation a business has. Take everything into consideration and you’ll be just fine. From there, once you’ve narrowed it down, take a look at the bond agency’s website. Is it helpful, or does it leave something to be desired? Is it outdated? Is it easy to find the contact info? If you feel good about making the call, go ahead and do it. You’ll be able to tell pretty quickly if you made the right decision based on how helpful the bondsman is when you give them a call. Learn more about how to find a bail bondsman online here. What Are Some Common Options For Bail Bond Collateral? What is bail bond collateral? To put it simply, it’s something that you can put up when you can’t cover the full amount of bail. In other words, if you have something of value, it may be needed to help ensure that you’re able to get your loved one out of jail. Generally speaking, items of value can include real estate, vehicles, or other valuable possessions. In short, if it’s worth money, it can usually be used as collateral. Important Note: At WGOBB, there is no collateral required for most bonds. We strive to provide our clients with options that work for them, so call us today and we’ll figure out what we can do to help you no matter your situation. Learn more about the most common options for bail bond collateral here. Although there is often some confusion on the difference between a bondsman and a bounty hunter, it breaks down like this: a bondsman is the person you work with to bail someone out of jail and a bounty hunter is someone that’s called in to track down someone who skips bail. So when would a bond agency enlist the help of a bounty hunter? The short answer is that it depends on the situation. Learn more about when a bondsman will hire a bounty hunter here. Let’s say that you can’t afford to pay your bail, nor can you afford to enlist the help of a bond agency. What happens then? Unfortunately, it means that you have to remain in jail until you’re released. Our advice is to enlist the help of a public defender who can provide you with options for your specific situation. He or she may be able to work with the judge who would then release you on your own recognizance. Although nothing is guaranteed, if you can’t afford to work with a bondsman, a public defender may be able to help you find a solution that works for you. Learn more about how long you stay in jail if you can’t pay bail here. If you’re in a hurry, don’t hesitate to contact us right now. We pride ourselves on being the Oahu bail bonds agency that is available to lend a helping hand 24/7. We know that emergencies don’t happen on a schedule, and that’s why you can always count on us to be there for you when you need help the most. If you’ve just gotten a call that your loved one has been arrested and you’re not sure what to do next, reach out to us, because we can help! We proudly offer free bond advice as well! If you don’t know what to do, don’t panic. Instead, reach out to our team of experts to get the help you need and rest assured that you’re in good hands. We work quickly and efficiently to get the job done the right way so that your loved one can get out of jail as soon as possible. Now that you know a bit about us, we’d like to answer even more of our most commonly asked questions. Keep reading to find out more! In most instances, the answer to this question is a resounding yes! At the end of the day, our mission is to provide help to people when they need it the most. Needless to say, the vast majority of people out there can’t just drop thousands of dollars to bail someone out of jail. That’s where we come in. Our bond agency is dedicated to give our clients choices. We know that different situations inevitable call for different solutions. That’s why we accept a number of different credit cards as well as cash. We also offer a number of different payment plans that can be tailored to suit your needs, and we offer up to a 20% discount for accounts that are paid in full. Learn more about payment options for bail bonds here. First, it’s important for us to note that for us to start the process of getting your loved one out of jail, we’ll need a bit of information. Generally speaking, we’ll ask for the name of the person who was arrested as well as the name of the jail, the booking number, and the bail amount. From there, we’ll let you know what the options are for your specific situation. As we mentioned above, we strive to provide our clients with options so they can choose which route works best for them. Of course, we also offer free bond advice, so if you’re uncertain of what the best move is, we’d be glad to share a suggestion backed by our expertise. Once you’ve purchased the bail bond, we’ll get started quickly to get your loved one released. After that, many people start to regain a sense of normalcy. There will certainly be some adjustments that need to be made, as well as meeting with lawyers to prepare for any upcoming court dates. Keep in mind that we’re here to help even after our job is done, so don’t hesitate to get in touch with us if you have further questions or need help. Learn more about what to expect after you purchase bail bonds here. When it comes to Honolulu bail bonds, there’s no one who will go above and beyond for you quite like Wanna Get Out Bail Bonds will. No matter the time of day or night, no matter the situation, you can count on us to spring into action to help you when you need it the most. Whether you and your loved one both live on Oahu or your loved one lives here and you live somewhere else, we can help. We’re also happy to work with those who are facilitating their own release from prison. Although you have many different options about where you can purchase bail bonds, we want you to know that our team is the one who will go above and beyond to ensure that you get high quality service. We’re local to Oahu, and that means that we know this area inside and out. It also means that we have working relationships with the people at the local jails, ensuring that we’re able to get down to business right away. At the end of the day, we know that you have options about which bond agency you will work with, but we want you to know that we strive to be the best of the best, taking customer service to the next level, and ensuring that you feel comfortable at every step of the way. 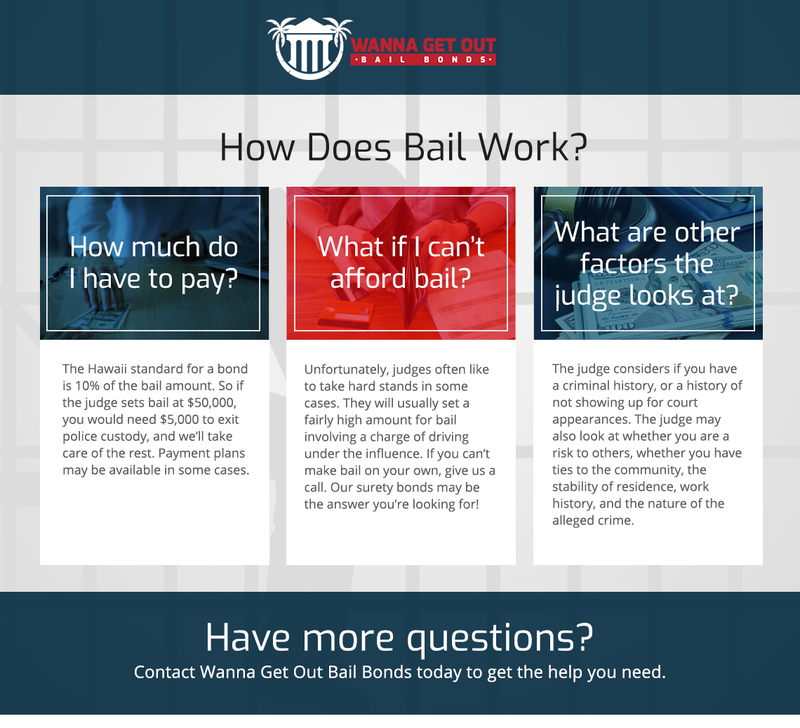 Learn all about Wanna Get Out Bail Bonds here. If you’ve just been released from jail, you might be wondering what to do next. The truth is that there’s no rigid set of rules — except, of course, for not skipping bail. Our advice? Speak with your lawyer regularly. He or she will be able to help you come up with a plan for your situation that ensures that you’re prepared when your court date comes around. You may know that in the United States, you have the right to a fair and speedy trial. Unfortunately, the legal system is one that can get backed up relatively easy, and depending on the caseload of local judges and attorneys, it can take several months until your trial is held. In other words, you’ll certainly be glad that you called us, because otherwise you’d be sitting in jail awaiting your trial, and no one wants to be in jail for that long. What else should you do while you’re out? That’s entirely up to you, but we’d also advise taking up a healthy hobby. Whether that means jogging on a beautiful beach or finding some books to read, having an outlet at this point in your life is a wise thing to do. No matter what your new healthy hobby is, investing time in it is sure to be a great decision. Learn more about what to do after you’re released on bail here. We touched on this question just a bit above, but it’s one of the questions that we get the most regularly. It’s not at all uncommon to be asked what type of info we need. Whether you’re calling us on behalf of a loved one or you are facilitating your own release from jail, knowing what to do can be intimidating. Thankfully, we can help! In the vast majority of instances, we’ll require a first and last name, the jail the person who was arrested is being held at, the booking number, and the bond amount. We’ll take it from there. If you don’t have all of that information, don’t worry — simply give us a call and we’d be happy to do some research for you or give you some advice about who to get in contact with. At the end of the day, there’s always a path forward, and we’re happy to help you find it. Learn more about what we can do to process a bail bond quickly here. When it comes to Oahu bail bonds, the standard amount for a bond is 10% of the bail amount. In other words, if the bail amount is set at $50,000, you would pay us $5,000 (taking advantage of our flexible payment plans, of course) and we’d cover the additional $45,000 required for the person who was arrested to exit police custody. Although the amount of bail varies from situation to situation, we always have options to suit the needs of our clients. For example, we offer up to a 20% discount when you pay in full. We also offer zero interest for most cases. At the end of the day, we believe that our clients deserve to have options, and that’s what we provide. There are a number of factors that a judge will consider when setting bail, so although we can’t tell you the amount that bail will be for a particular crime, we can tell you that the standard amount you’d pay us is 10%. Learn more about the prices associated with getting a person out of jail here. That leads us to our next question, and it’s one that many people want the answer to. The answer is that it depends. So what does it take to get your bail money back? Generally speaking, if you bail your loved one out of jail with cash, as long as he or she attends all court dates, you’ll get that money back. Of course, that means the opposite is true as well. If your loved one makes the decision to skip bail and not attend court dates, you’ll be out the money, and your loved one will have a warrant issued for his or her arrest. There’s more to it than that, of course, but those are the most common scenarios. If you have a question about whether you’ll get money back for your specific situation, don’t hesitate to contact our team, because we’d be glad to provide you with all of the information you need. Learn more about whether or not you can get bail money back here. 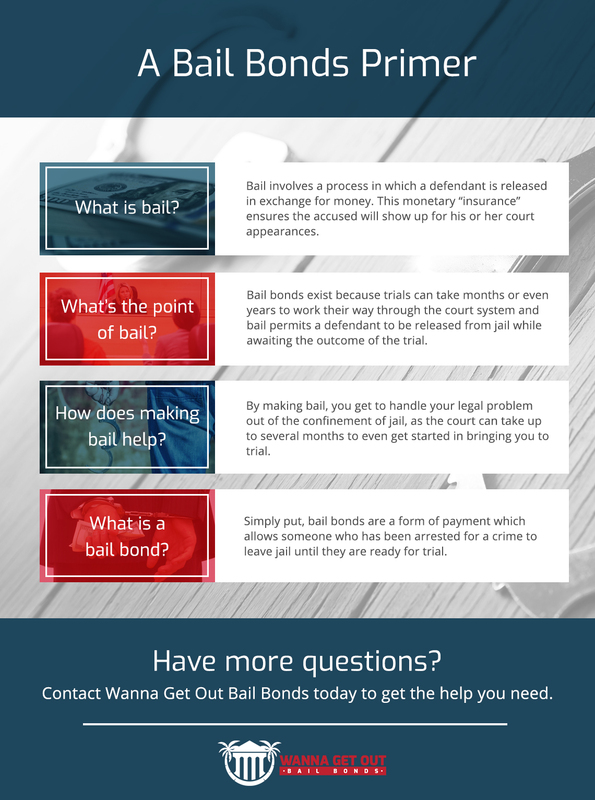 Click here to see even more questions about how bail bonds work! We happily offer up to a 20% discount for accounts that are paid in full as well as zero interest and flexible payments plans. Our goal is to give you options that work for you. It’s as simple as that. When it comes right down to it, we know that you have plenty of options about which bond agency you’ll work with. Go ahead and read our reviews, check out our website, and give us a call. We’d be glad to answer your questions and get to know you a bit. We think you’ll find that you’re in great hands when you put your trust in our team of experts, so put us to the test today! Have a Question? Contact a Local Bondsman! Although we’ve tried to answer a number of our most regularly asked questions above, the truth is that there are probably some that we’ve missed. Not to worry though, because at Wanna Get Out Bail Bonds, our goal is to provide you with the answers you need. If you have a question we didn’t cover or you need clarification on something above, feel free to contact us. There’s nothing we love more than lending a helping hand when you’re in need. As a matter of fact, that’s why we’re in this line of work. Our industry can be downright confusing to people, but rest assured that we’ll always shoot you straight at Wanna Get Out Bail Bonds. We truly hope that this page has been helpful to you, but we’d like to reiterate — our industry is tricky, but we have answers. Don’t hesitate to call us any time. You’ll be treated to exceptional customer service that’s focused on helping you make sense of a difficult time. With free bond advice that’s tailored to your specific needs, you can rest assured that Wanna Get Out Bail Bonds on Oahu is here to help you when you need help the most.